Library services are available to Lincoln County residents and accounts are free! A library card is required to check out any materials. You may print the application or come to the library to get one. For children under 18, the signing adult is responsible for materials checked out on the child's card. Please bring, do not mail, the completed application to the library at 301 W. 7th Street, Stroud, OK.
New patrons may check out one book per card the day they open an account, and up to four books when the first is returned. You may view your account online in the library catalog. Please contact the librarian for login information. Books and audiobooks check out for two weeks. DVDs check out for one week. Items may be renewed in person, via the phone, email, or the online catalog for one additional check-out period. Fines for overdue books are 5 cents per day, per book; however, there is a one day grace period. Items may be returned to the book drop located on the north side of the building. Significantly overdue books or large, accumulated fines may suspend your account. 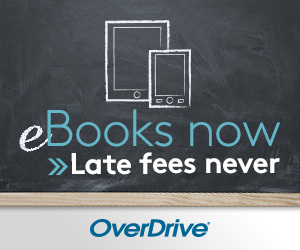 E-Books are now available for Stroud Public Library patrons through the Oklahoma Virtual Library and OverDrive. Contact the library to set up an e-book account. You will need a library card (see above) and an email address. Then go to http://okvirtuallibrary.lib.overdrive.com to log in. to download e-books to your specific device. Please read the Internet Use Policy for full details about using the internet at the library. Permission to use a computer is separate from having a library card. The internet release form must be signed in person at the library to use library computers. For children under 18, a legal guardian must be present to sign the form. Time on the computer will be limited as necessary to serve all patrons. Contact your friendly librarian today!